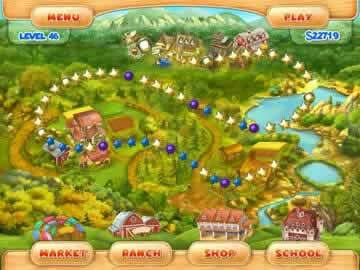 Farm Mania 2 Game - Download and Play Free Version! 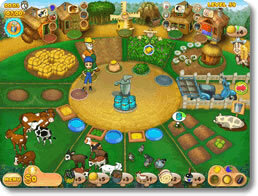 This Fast-Paced Farm Management Game Will Keep You Clicking For All You're Worth! A New Farm Means a Challenging New Adventure! Anna impulsively decides to buy a rundown farm but she and her grandpa are ready to get the farm back into good shape and make tons of money in the process! Also help Anna find that special someone as she meets new farmers. Fans of Farm Mania are sure to enjoy this standalone sequel because gameplay is similar but with new upgrades and twists! In this task management game, direct Anna to plant, water, weed and harvest crops like carrots, pumpkins and strawberries, as well as feed and care for animals. Grandpa will help you gather food for the animals, harvest fruit from trees and get water. You can even catch fish and make processed goods like bread and cheese. For each level, you must accomplish a set of objectives, like selling five cabbages, selling wool from three sheep and earning $1,000. Buy tons of upgrades like faster shoes, bowls that hold more water for the animals and scarecrows to scare away crop-destroying pests. This is a great game for gamers wanting less stressful task management games because you can't lose a level; you'll earn less cash but you won't have to restart a level if you run out of time. Advanced gamers can also enjoy this game because it's a challenge to earn an Expert score on every level. Hidden object levels keep gameplay fresh as you search for lost farm animals. With all the mad clicking and multitasking each level offers, you'll be busy for hours and hours! 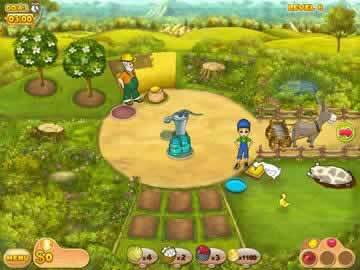 For an exciting time on the farm play Farm Mania 2 now!